Imagine crawling inside a giant inflatable ball and bouncing around like beach balls with your friends. Sounds pretty awesome, right? We think so, which is why GameTruck Jacksonville offers Bubble Soccer! If you’re looking to host a party or event that your friends will be talking about for weeks, a GameTruck Bubble Soccer party is the way to go. 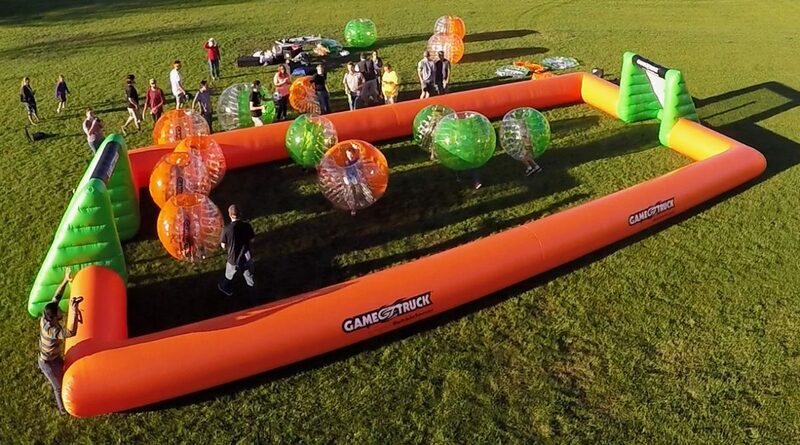 With GameTruck, you can transform your yard or a park into a 25×50 Bubble Soccer arena. Bubble Soccer is a team-based play game where the players are wrapped in giant, inflatable balls with handles and shoulder harnesses inside. It’s a little bit of sumo wrestling mixed with soccer. Players bounce around the field and bump into their opponents as they try to kick the soccer ball in the goal. It’s impossible not to laugh while playing or watching a game of Bubble Soccer! To get an idea of what Bubble Soccer looks like, check out our video. Who Can Play Bubble Soccer? One of the greatest things about Bubble Soccer is that it provides fun for all ages. Bubble Soccer is great for birthday parties, private events, corporate functions, team building exercises, and community events like fairs and carnivals. Our high-quality inflatable balls allow players to bounce around and fall down without any risk of hurting themselves. Our experienced GameCoaches emphasize safety and fun during the game, making sure to help players up after they fall. How Do I Host a Bubble Soccer Party? Booking a Bubble Soccer party with GameTruck is simple and stress-free. Once you decide on the date of your event, give GameTruck Jacksonville a call to book your date and time.Through access to our online party planner, free invitation options, and confirmation calls, our party planning specialists work hard to ensure that your Bubble Soccer party is a success. Our GameCoaches manage the entire event, so, as a host, all you have to do is sit back and enjoy watching your guests have a blast (and join in on a game, of course). Let GameTruck Jacksonville create a memorable event that your guests won’t stop talking about. Whether you want to host a Bubble Soccer party, laser tag event, or video game truck party, GameTruck Jacksonville is prepared to make it a success. To get started, give us a call today at (904) 900-0880. Which game console is best for families?